In the Whistler Question this week: Sliders from Ontario, Australia join locals at Whistler Sliding Centre event. The awnings were drawn at the Whistler Sliding Centre (WSC) last weekend (Dec. 19 - 20) to keep copious amounts of snow off the ice, allowing sliding athletes to reach speeds in excess of 130km/h for the first two British Columbia Bobsleigh and Skeleton Association (BCBSA) BC Cup races. One of those athletes was Whistler local and Whistler Secondary School graduate Mitch McCullough, 19, who now studies at the University of British Columbia (UBC). McCullough walked away with a first place in skeleton on both the Saturday and the Sunday events, leading with an average of around four seconds and clocking his speed as high as 137km/h. McCullough began learning skeleton at the age of 16 in Whistler and has continued to compete and even gets to represent Canada at some events. He is currently sitting on the B.C. team, but has been competing against other nations at North America’s Cup events. For the remainder of the season McCullough wants to better his consistency on the home track in Whistler, but is under pressure to balance racing with his university studies. There were also a few women representing British Columbia over the weekend. Julie Johnson, 23, originally from Saskatchewan, but now living in Vancouver and studying at UBC, managed a third place on Saturday and second place on Sunday in the two-man bobsleigh event with her rookie brakeman Simone Slipper. 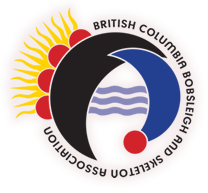 Johnson noted that that the BCBSA is currently recruiting female bobsleigh and skeleton athletes and encourages any women interested in the sport to try it out. For more information on learning sliding sports, check out whistlersportlegacies.com or slidebc.ca. For more BC Bobsleigh and Skelton action in the Media - visit our media page here.